This is one creature, that despite its massive size, you rarely see, especially in the eastern part of the state. The Florida black bear, ursus americanus floridanus, once numbered about 12,000 and roamed throughout most of Florida and parts of southern Alabama and Georgia. It now numbers only about 3,000 (some estimates put the number as low as 1,500) and roams only a fraction of its former territory. The good news in those numbers is that estimates put the number of Florida bears in low hundreds during the 1970s, making it something of a comeback success. The Florida Fish and Wildlife Conservation Commission no longer lists the bear as threatened, but it still is illegal to kil or injure a bear, or possess bear parts.The problem for the bear population, as it is for most large animals, is loss of habitat. It's estimated that a single bear needs 400,000 acres of land and a variety of different habitats, from scrub to swamp, in order to survive. 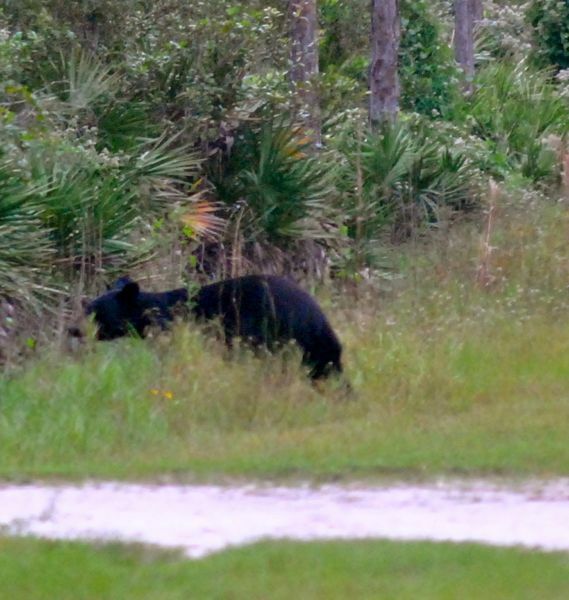 Those 400,000 acres are becoming more and more scarce as Florida's human population expands, so the FWC has divided the state into bear management units the correlate to to current bear range as part of an effort to protect the creature. Bears can be 5 or 6 feet long, 3 feet tall at the shoulder; an adult female can weigh between 150 to 300 pounds; a male between 250 and 400 pounds. Although bears are omnivores, their diet is mostly vegetarian — fruits, nuts and berries — with a smattering of insects and a little meat thrown in. It is a shy animal, most active at dawn and dusk depending on the season, although the FWC says bears that live on the fringe of human populations tend to be more nocturnal. when human activity is at a low point. And despite Florida's mild winters, the black bear hibernates from December to April. 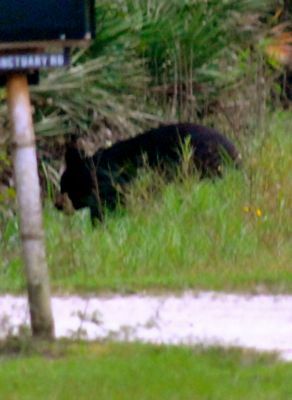 Florida's largest bear population is in and around the Ocala National Forest in the central part of the state. We spotted this one near the Corkscrew Swamp Sanctuary.